How to Compress a Video for WhatsApp on Windows or Mac Easily Without Losing Quality? Compressing video files for WhatsApp is badly needed because of the 16mb WhatsApp video size limit. WhatsApp is a free cross-platform instant messaging app for smartphones, which allows users to send videos to other users for communication. The feature "Status" enables users to upload photos and videos to a 24-hours-lifetime feed. Especially, the end-to-end encryption feature of WhatsApp is great enough to well respect and protect privacy of users, for example, when two lovebirds are in need of sharing intimate videos that are only visible to each other. In this case however, except for Whatsapp supported formats issue, the WhatsApp video size limit (its video limit 2017 is 16 MB) is a big fence, and you have to compress video for WhatsApp. Part 2: How Can I Compress a Video for WhatsApp? There are frequent situations you'll need to send HD/4K video, such as a GoPro video that is larger than 16 MB to others using WhatsApp. What if you want to send a 1080p HD movie clip, what if you intend to transmit a video shot by your 4K/HD digital camcorder? The best solution is to reduce the video file size for WhatsApp. VideoProc - Compress any large video file to smaller than 16MB for WhatsApp in ideal quality; convert incompatible videos to the video formats supported by WhatsApp for iPhone, iPad, Android, etc., allowing video merges/editing, aspect ratio adjusting and so on. A hardware video encoder, decoder and processor. Part 3: What Video Formats Are Supported by WhatsApp? Not all videos can be played or uploaded through WhatsApp due to the video format acceptance. When compressing videos for WhatsApp, you should also consider the output format (as well as codec). To convert an unplayable or unshareable video to other format for this app, you should first know what video/container formats and Codecs are supported by WhatsApp. 1. You should also consider the codec that the end device is having. That is to say you have to be clear about, for example, iPhone supported video formats, iPad mini video formats, Android file formats, Amazon Kindle Fire video formats, Windows Phone formats on which the WhatsApp is using. 2. Even though WA allows uploading FLV videos, its in-built player will not play the .flv file. For directly playing, please switch to converting your videos to other formats like MP4 by using an MP4 converter. Part 4: How to Compress a Video File Without Losing Quality? With respect to video compression, the quality loss comes and hinges on many factors, including the source video quality, the compression ratio, the selection of output format, and the product quality of the video compressor you are choosing. Step 1. Download and install a video compressor for WhatsApp 2018. Step 2. Input your source video file. Open the WhatsApp video compression software on your computer, on the main interface, click on "Video" icon, and then "+ Video" on the top left, browse and select any video file, e.g., a 2.7K/4K skiing video recorded by GoPro camera, you need to compress and load the video file. Batch mode is supported, so you can add several video clips at one time. Note: HEVC codec is the most recommended as an option for output format because of its higher video compression rate (than H264), wide acceptance and so on. The quality loss is minimal if you compress an HD or SD video to HEVC encoded MP4 or MKV video. According to our test, the compression ratio of changing an H264 to HEVC video will reduce file size by over 90% at most. 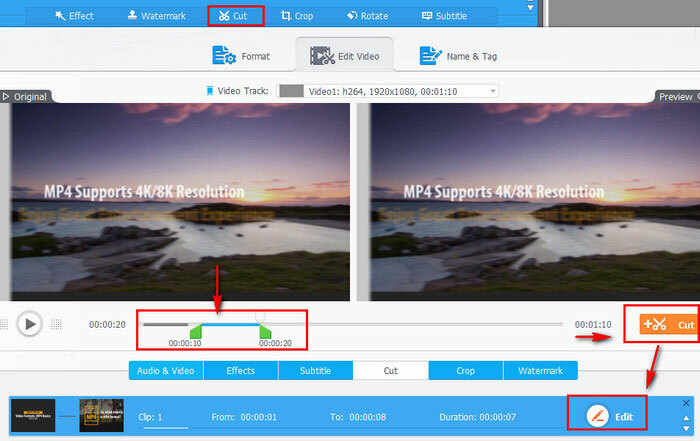 For HEVC MP4 format: Find HEVC Video in General Profiles or General Video as Target Formats. Step 4. Calculate the output file size roughly. Since you cannot preview the output file size, you'd better calculate the output file size roughly by yourself based on the file size of source file and the compression ratio. Averagely, VideoProc can reach over 90% compression ratio when compressing an HD video to MP4 (HEVC codec). Step 5. Remove unnecessary parts of the video(s). Cropping: crop the black boarders (if any) of the video image: Editing bar -> Crop -> check "Enable Crop" -> drag&pull or adjust the dashed box -> Done. Cutting: Editing bar -> Cut -> drag knob to set time position -> click Cut button on the right -> edit the duration -> repeat the operation if necessary. By cutting, the video can be cut into different clips by any parts in any duration or any sequence. By trimming using this WhatsApp video compressor, a long video can also be cut into several parts regularly. Step 6. Start compressing video for WhatsApp required file size and format. After determining the Destination Folder to save the output file, tap "RUN" button to let the WhatsApp video compression process go. Step 7. Transfer the compressed video file from computer to mobile. Open the destination folder, find the compressed video file, and copy and paste it from the computer to your Android smartphone using a USB cable. 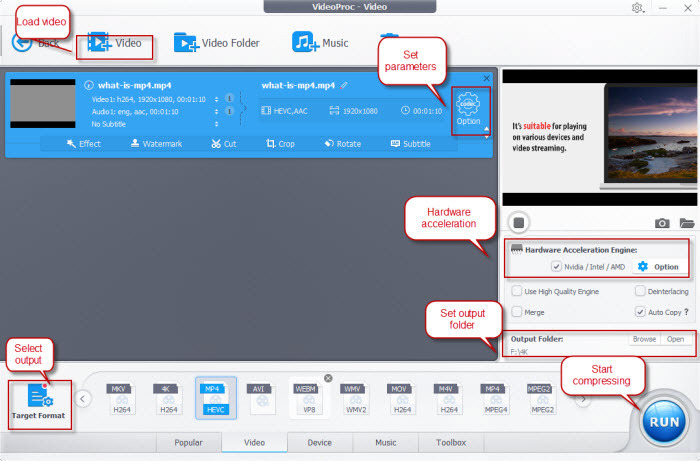 Transfer the video file from the computer to your iPhone using iTunes or WinX MediaTrans. Finally, you can send the compressed video file(s) to others through WhatsApp. Part 5: How to Convert and Compress Video for WhatsApp Easily? Step 1. Download and install a video compressor 2018 for WhatsApp. Step 2. Load your source video file. Click on "+ Video" on the top left of the UI, browse and select the source video file. Step 3. Choose an output format for conversion. You can choose MP4 as suggested or any video format that is supported by WhatsApp. Step 4. Adjust the parameter of the video. Click Option button, and then you can adjust or customize Video Codec, Bit Bate, Frame Rate, Aspect Ratio, Resolution and so on. The following parameters are working for WhatsApp, and can be taken as references for parameter settings. Setting Destination Folder will help you find the output file easily after the WhatsApp video compression and conversion. You just need to Browse and Select Folder. Step 6. Click "RUN" to start the WhatsApp video compression. Check an option of "Hardware Acceleration Engine" for faster video compression, and then Click "RUN" button to compress video for WhatsApp. Still not enough for video sharing? An HD video of 30-40 sec will be around 18-20 MB, video size can easily reaches hundred MBs to GB, so WhatsApp's 16 MB video file limit is still far from enough for most users. Why not give upon this, and find another way to transfer video, photos or other files? Email is a good alternative. If you dislikes online sharing, face-to-face transfer (say, using USB, Bluetooth, iPhone's Airdrop), is a safe choice almost without any limit in file size. WinX MediaTrans – Transfer large videos between iPhone and Computer in Seconds! No matter how bulky your video files are, WinX MediaTrans can send them from iPhone to PC/hard drive or vice versa at breakneck speed, in batch. In addition, all your iTunes purchases, photos, music files, ringtones, e-books/audiobooks, Voice Memos, podcast and iTunes U can be backed up easily. How do I transfer WhatsApp photos/pictures from iPhone (XS, XR, 8 etc.) to PC? Go through this tutorial to know how to do so easily and safely. When you want to convert videos to file formats supported by Whatsapp for sending and sharing, free download Whatsapp video converter for Windows/Mac here. Follow the 3 ways to download and transfer WhatsApp videos from iPhone to (Windows 10 PC) computer for WhatsApp video backup and space saving. Part 1WhatsApp for Photo and Video Uploading? Part 2 How Can I Compress a Video for WhatsApp? Part 3 What Video Formats Are Supported by WhatsApp? Part 4 How to Compress a Video File without Losing Quality? Part 5 How to Convert and Compress Video for WhatsApp Easily? Best 5 Free Windows 10 Video Editors - Crop, Trim, Merge, etc.